The American Legion Family gives year-round to veterans, their families and their communities. But the holiday season is often a time that the Legion Family goes above and beyond. This December, Legion Family members across the country are delivering presents to children to ensure they feel the spirit of Christmas during this joyous season. I know posts, squadrons and units everywhere are participating in the gift-giving season for children and families, but the following are a few stories that came across my desk. Through donation support, the department spent nearly $18,000 on toys for the children this year, with $10,000 of it coming from the Sons of The American Legion Kansas detachment. The SAL donation “is a huge help,” Foster said. The event also includes door prizes, face painting, games and family-orientated activities. American Legion Post 145 in Avon, Ind., is hosting its fourth annual Indiana Blue Star Spirit of Christmas event for 70 children of military and veterans’ families who are in need. The children receive almost everything on their wish list plus clothing and shoes; and the parents are also recipients of gifts. Santa arrives in a Huey to distribute the gifts and visit with the children. “It brings extreme joy to every one of us to put a smile on each and every child,” said Indiana Blue Star Chairman and Post 145 member Ralph “Zoc” Zoccolillo. American Legion Post 16 in Lynchburg, Va., presented 120 stuff animals to the local police department. The animals are to be handed out to child victims of domestic violence, vehicle crashes and other similar incidents during the Christmas season, and beyond, to bring comfort. American Legion Robert E. Coulter Jr. Post 1941 in La Grange, Ill., held its first Toys for Tots drive. The post collected 400 toys and $700 in donations for the program. “No child should wake up on Christmas without a toy,” Post 1941 member Bill Kiddon told the Chicago Tribune. 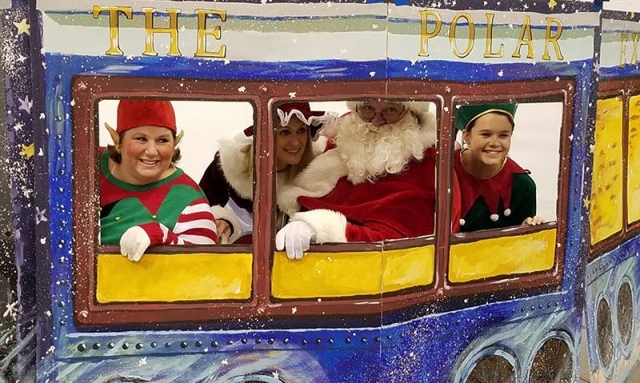 American Legion Costello-Monahan-Brown Post 964 in Pleasant Mount, Pa., sponsors a Christmas in the Village where children get their picture taken with Santa. American Legion Post 42 in Grand Canyon, Ariz., has hosted a Christmas program for children in pre-school through third grade for the past 20 years. The children receive refreshments, sleds made out of candy canes, and knitted scarfs and hats by Legion Family members. As your Legion Family celebrates Christmas with children in the community, please share at www.legiontown.org.